Fleet Flower Club is proud to have supported Phyllis Tuckwell's Ladies Lunch held on Friday 14 September 2018 at Oak Park Golf Course. The lunch was attended by 120 ladies and the guest speaker was Joy Hunter MBE, former secretary to Winston Churchill, who no doubt had fascinating stories of her time working for this charismatic politician especially during the second world war! 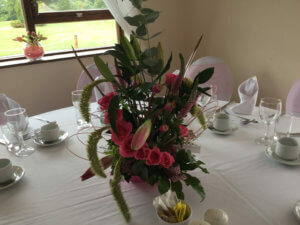 Phyllis Tuckwell had asked the Club to make a table decoration, using pink flowers, which would then be raffled at the end of the lunch to raise funds for this worthy charity. One of our Club members, Vicky Hart, volunteered to make the arrangement which you can see below.